on Wednesday, March 14 at 7pm! at amy.frillici@yahoo.com or call me at (989) 330-0259. 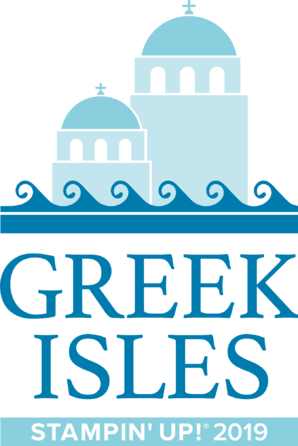 I'd love to have you join us this month! This first card features a Pool Party base (a beautiful spring color from the 2011-13 In Colors!) and a layer of the Sale-a-bration Designer Series paper, Everyday Enchantment. You, too, can have this gorgeous Designer Series paper - FREE - this month with a $50 order! Just call or email me for more details! I also used the Triple Treat flower stamp (another FREE choice with a $50 order this month) in three different colors (Pool Party punched with the Fancy Flower punch, Lucky Limeade punched with the 5-Petal Flower punch and Soft Suede punched with the 1/2" Circle punch). I added a Basic Pearl to the center of the flower. The sentiment, Kindness Matters, is from the Kindness Matters stamp set - yet another FREE choice with a $50 order thru March 31! The sentiment is stamped on a Very Vanilla Large Oval punched piece and layered on a Lucky Limeade Scallop Oval punched piece. The final touch is a strip of Pool Party card stock with 2 more Basic Pearls - can't get enough of those pearls! - and at $4.95 for 150 of them, you can't go wrong! This next card brightens things up for spring! It features a Whisper White card base, a layer of Concord Crush In Color card stock (which will be retired on May 31 - if you like this color, make sure to order it before then! ), followed by a layer of Melon Mambo card stock embossed with the Square Lattice embossing folder and the Big Shot! The flower and sentiment are stamped in Concord Crush Classic Ink and are from the Sprinkled Expressions Stamp set - another FREE stamp set with a $50 order thru March 31! I tied a bow with the Concord Crush 1/2" Polystitch ribbon for some added fun - this ribbon will also retire on May 31! - I am soooo going to miss these In Color ribbons - they are gorgeous and so fun to play with! This next card is what we call "Clean and Simple". It features a Whisper White card base, a layer of Island Indigo card stock and another layer of Whisper White card stock. 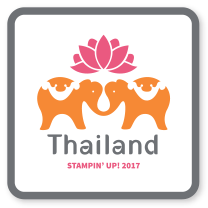 The sentiment "Wonderful You" is stamped in Island Indigo and is from the Loving Thoughts stamp set in the Occasions Mini catalog. This stamp set is perfect for Cards or for Scrapbook pages! We punched three butterflies from the Twitterpated Designer Series Paper (also found in the Occasions Mini) with the Butterfly punch. Another fun touch..... the Large Pearl Basic Jewels (from the Occasions Mini) are the "body" of each butterfly. 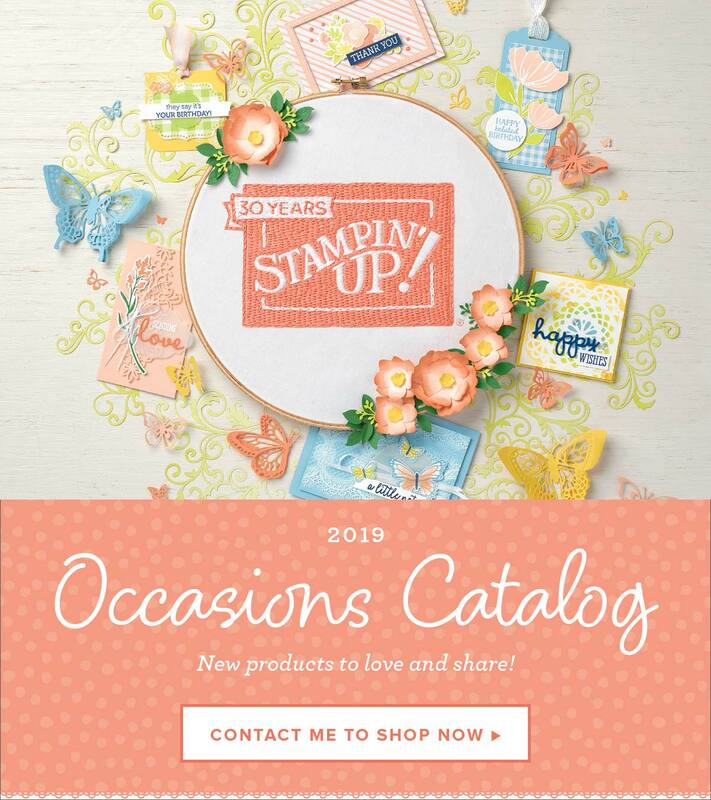 Don't forget that the items in the Occasions Mini are only available until April 30th! Finally, I tied a ribbon around the card with the Island Indigo 3/8" Ruffled ribbon - love this ribbon, too! The last card for this month has a Soft Suede card base and another layer of the Sale-a-bration Designer Series paper, Everyday Enchantment. You can also get this beautiful Designer Series paper (along with the Fresh Vintage Stamp set and Everyday Enchantment Ribbon and Brad pack) if you hold a qualifying workshop before March 31 - just ask me how today!! We stamped the flowers and bird with the Language of Friendship stamp set (another FREE stamp set from the Sale-a-bration catalog with a $50 order this month) on Calypso Coral and Soft Suede card stock and then punched them out with the Boho Blossoms and Bird Builder punches. These pieces are layered on a Very Vanilla square and a Soft Suede scalloped square made with the Scalloped Squares Duo Bigz die and the Big Shot. The final touches are the Basic Pearls and the Very Vanilla seam-binding ribbon! What a beautiful card - perfect for a good friend's birthday or just to say "Hello"! I hope you enjoyed these cards this month! 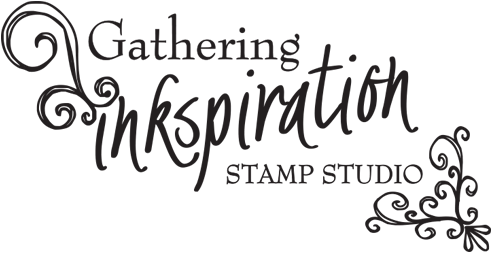 Don't forget that this All-Occasion Card Class (make 4 cards for $12 or receive your cards for FREE with a minimum $25 Stampin' Up order) meets the second Wednesday of every month at 7pm. Just call me at (989) 330-0259 or email me at amy.frillici@yahoo.com if you'd like to join us at class anytime! I'm now offering a Cards-To-Go option for this class! I'll stamp and punch all items for the 4 cards for you. Then I'll either mail them to you (cost is $15 for the 4 cards and postage/packaging), or if you'd like to pick up the supplies to make the cards, the cost will be $13. You can them assemble them at home at your leisure. Just refer to the pictures/instructions on my blog to help in assembly of the cards! Finally, I'm now offering this class as a club option as well!! Please let me know if you're interested in joining the club. This is how it works: Place a minimum $25 order each month during club. You'll get the 4 cards for free. Club is 10 months long and never ends. You can sign up again once your 10 months are up. We'll combine the orders from club each month, and you'll receive the awesome hostess benefits one month from those combined orders! 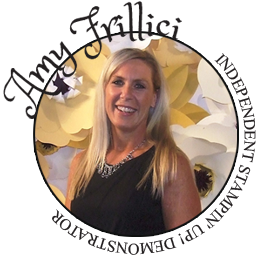 Just call me at (989) 330-0259 or email me at amy.frillici@yahoo.com if you have any questions! Birthday Calendar Class - April 11 at 6pm! Mini Scrapbook Class - Sunday, March 25 at 2pm! !